Finals of the Adult/Child Champion bracket, played at the historic Lanterman House: Adel Kamal runs two wickets on one shot while his father Mohammad Kamal watches. It was déjà vu at the 12th annual Lanterman House 9-wicket croquet tournament, with many of last year’s winning teams successfully defending their titles. The tournament started with 30-minute single elimination rounds on Saturday, May 26th, at Memorial Park in La Canada, a suburb of Los Angeles. The finals were played the next day on the grounds of the historic Lanterman House in front of a crowd of both croquet enthusiasts and those touring the grounds. Divisions consisted of Adult/Adult doubles or Adult/Child doubles. Each division had a champion bracket (for very good players) and an open bracket (for other levels of experience). The most intense play was in the Adult Doubles Champion bracket. For the second year in a row, Ed Therrien and Chris Del Guercio advanced to the finals by beating past champions Caren and Eric Sawyer; and Steve Del Guercio and Jim Kambe (defending champions) advanced by beating past champions John Therrien (father of Ed) and State Assemblyman Anthony Portantino. In a replay of last year’s finals, Steve Del Guercio (father of Chris) and Jim Kambe handily defeated Ed Therrien (son) and Chris Del Guercio (son) 26-8. The match was fairly close half-way through until Steve Del Guercio went on a major run and pulled his team ahead for good. The Del Guercio/Kambe team has dominated this division for many years. In the Adult Doubles Open bracket, Jordan Del Guercio (brother of Chris) and Clay Therrien (brother of Ed) both staked out to beat the team of Dave Nydam (who played in last year’s finals in this division) and his father-in-law Bill Bierlins. Rumor has it that the Del Guercio/Therrien team may move up next year to the Adult Doubles Champion bracket to take on their brothers for family bragging rights! The Adult/Child Champion bracket was the most thrilling match. Last year’s winners, David (father) and Lucas (son) Collins, played Mohammad (father) and Adel (son) Kamal in the finals. 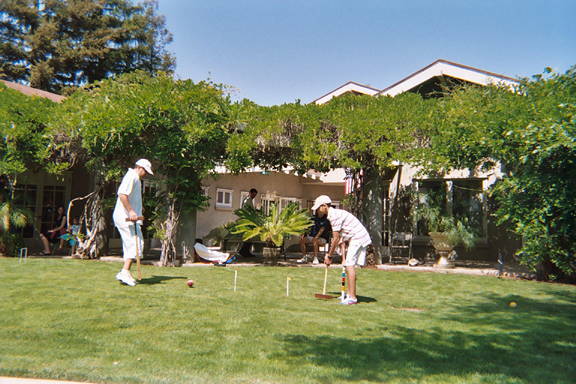 David Collins and Mohammad Kamal are both very experienced six-wicket players and also founding members of the Pasadena Croquet Club. Lucas Collins also won the youth division of the Safari Croquet Adventure tournament in San Diego last year, and so he had a winning streak on the line. The match was a well-played, defensive battle, with plenty of strategy displayed. The Collins team was finally able to break-away and post a 27-16 victory to win for the second straight year. Finally, in the Adult/Child Open bracket, last year’s winners Steve Del Guercio and his daughter Cami defended their title by beating Duane Roth and his daughter Valerie, who played in this event for the first time. The Del Guercios will probably move up to the Adult/Child Champion bracket next year, setting up a possible clash against the undefeated Collins team. 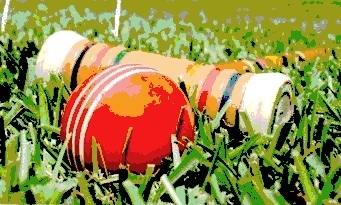 The tournament is indebted to Bob Moses, who again served as head referee; the generosity of Mr. Richard Dewey of the Croquet Sport Company, who has donated croquet equipment to the tournament for many years; and the USCA 9-Wicket Committee.